The Race Director of the Tour of Britain, won bronze medals in the 4,000 metres team pursuit at the 1972 Munich Olympics and the 1976 Montreal Olympics. He also raced in the 1,000 metres Time Trial at Munich, coming 17th. Klaus-Peter entered the road race in the 1976 Montreal Olympics and finished in ninth place. He then turned professional in 1977. In the 1978 Tour de France, he lead the race for two days, after his team won the team time trial. Klaus-Peter organises the Tour of Hope bicycle charity ride, and was given the Pierre de Coubertin medal for that in 2005. RRA record breaker in 1969 for Cardiff to London on a Tandem Tricycle in 6 hours 42 minutes 6 seconds. Winner of the Bidlake Memorial Plaque in 1983 for his initiative in organising city centre cycle races in 1983 that led to their television presentation and so to being seen by more than a million viewers. Winner of the Bidlake Memorial Plaque in 1995 for his enthusiastic support and promotion of all branches of cycling, including the generous backing for the Centenary 50 to mark the anniversary of the first time trial in 1895. Winner of the Bidlake Memorial Plaque in 1998 in recognition of his unique ability in the promotion of cycle sport through his television commentaries of international cycle racing. David Duffield has broken 12 RRA records (all on tricycle) including two successes at Land’s End to John o’Groats. He also briefly held the RTTC 100 mile tricycle record in 1958. Winner of the Bidlake Memorial Plaque in 1991 for his 12 hours national competition record of 300.08 miles to become the first rider to average more than 25 m.p.h. when he won the Poole Wheelers event on 1st September 1991. This ride also ensured his second victory in the British Best All-Rounder Competition. Glenn is a multiple Time Trial champion. He holds 5 RRA records in addition to his 11 RTTC records (both totals are a mixture of two and three wheeled exploits). Ralph Dadswell "Master Tommy Bardell"
Ralph has broken 39 records between 1990 and 2010 for the Solo Trike and the Tandem Trike, five of which were improvements to his own records, and only two having been broken by another rider. These records are for distances ranging from 50 miles to 840 miles (Land’s End to John o’Groats). Ralph has broken 15 records between 1989 and 2005 for the Solo Trike and Tandem Trike of which 10 have still not yet been broken. These records are for disciplines between 10 miles and 24 hours. Additionally, Ralph holds one Eastern Counties RRA tandem trike record; two Midlands RRA tandem trike records; eleven North & West Home Counties trike records; two RRA of Scotland solo bike records; and four Southern RRA trike records. 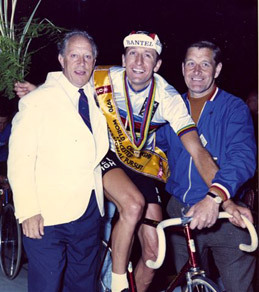 Tony was world pursuit champion in 1980 and 1986. He was a professional between 1980 and 1995, riding for British teams. He won bronze in the individual and team pursuits at the 1978 Commonwealth Games. He finished fifth in the team pursuit at the 1980 Summer Olympics in Moscow as part of the British team. He was not selected for the individual pursuit even though he was the national champion. As a result Tony turned professional and won the world professional pursuit championship, beating Bert Oosterbosch and Herman Ponsteen. He then raced six-day track races with a variety of partners before achieving great results partnering the Australian Danny Clark. Tony became a regular in six-day track races during the 1980s, winning 23 six-days. As a result he was, and still is, Britain's most successful six-day rider. He was noted for fluid and rapid pedaling, which brought him an unofficial UK time-trial record for 25 miles on a 72-inch fixed gear in 56m 30s. In 1988 Tony suffered from a serious head injury and multiple fractures at the Munich Six-day. He was given the last rites and was in a coma for ten days. He spent six weeks in ITU, followed by two months in a rehabilitation centre. Due to the extent of his injuries it was predicted that he would be unable to return to professional racing. Tony received the Bidlake Memorial Prize in 1980 following his first world championship. He received an MBE for services to cycling in 1989. He took silver in the team pursuit at the 1994 Commonwealth Games in Victoria, Canada. Unfortunately, a broken back as a result of a crash at the Six-day in Zurich ended his professional career. After, he remained in sport and in particular cycling. Tony became President of the British Cycling Federation in 1996. He was the founder director of the Tour of Britain that restarted in 1994. In 2009, he was inducted into the British Cycling Hall of Fame. Tony Doyle is currently Chairman of the Olympic Delivery Board for the London Borough of Southwark. Hugh Porter MBE "Jonas Mudge"
From 1967 until his retirement from professional racing in 1973, Hugh was world professional champion in the 5,000m individual pursuit four times, second place on two occasions and taking bronze on the other. He continued to race on the road in summer and in winter six-day races. He even won cyclo-cross events. Nowadays, Hugh is a TV and public-address commentator at events. He is the voice of cycling for BBC Sport, the Olympics and Commonwealth Games (track and road), World Championships (track and road) and World Cup track meetings. He commentated on the 2009 Tour of Britain, while also the public-address commentator. He kept referring to the 'stage announcer', which was himself. Hugh is a regular at Manchester and Newport velodromes, and is the voice of the Revolution series at Manchester. He is often assisted by his wife Anita Lonsbrough who sits alongside him off-microphone and helps him with his notes. Hugh's achievements were celebrated in 1972 when Cycling Weekly awarded him his own page in the Golden Book of Cycling. 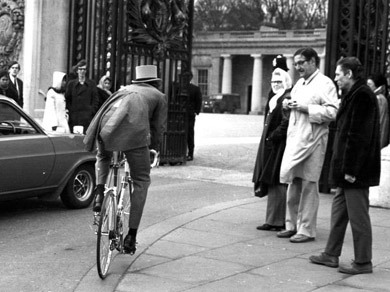 In 1973, he travelled to Buckingham Palace and was made an MBE for services to cycle racing. 2009, he was inducted into the British Cycling Hall of Fame. Winner of the Bidlake Memorial Plaque in 1968 for his victory in the World Professional Cycling Pursuit Championship at Rome on 29th August 1968. Wolverhampton University. He also has a road is named after him! Reg Harris OBE "Gabriel Grub"
Reg Harris was a member of The Pickwick Bicycle Club for 35 years from 1957 until his death in 1992. He was PBC President in 1971, and as a bon viveur and raconteur, he was truly representative of our Club. Three months before the start of the London Olympics in 1948, Reg fractured two vertebrae in a road accident. With only a few weeks to train, he then fell in a 10-mile race and fractured his elbow. Although he won two Olympic silvers in the sprint and tandem sprint, he was disappointed that he was prevented by NCU officials (timetable constraints) from winning what would have been an almost certain gold in the kilo – as Reg said coldly, this was the one gold medal he could have won. Reg won the world amateur sprint in Paris in 1947 riding a Claud Butler bike. He then won the professional sprint championship in Copenhagen in 1949, 1950 (Belgium), 1951 (Milan) and again in 1954 (Cologne). He made his comeback 20 years later to win the British championship in 1974 at the age of 54 on the same Raleigh bike he had used 25 years earlier. Winner of the Bidlake Memorial Plaque in 1947 for his victory in the Amateur Sprint Cycling Championship of the World at Paris on 27th July 1947. He won the Plaque again in 1949 for his victory in the Professional Sprint Cycling Championship of the World at Copenhagen on 28th August 1949, during the first year of his professional career. He was the first Englishman ever to win this title. He won Sportsman of the Year in 1950, and was runner up in 1949 and 1951. Awarded the OBE in 1958 - Reg was a great man and a great champion.